Food and music, the two things in this world that can soothe one's soul and mind. Had the opportunity to meet and listen to 3 of the Indonesian Idols at The Stirling Bar & Grill a couple of weeks back! And Steven Lim was invited.. I consider it an achievement to have a photo with the infamous Steven Lim, who was one of the contestants in Singapore Idol Season 1. This is Michael Jakarimilena (Micky), who was one of the finalist in Indonesian Idol Season 1! And this would be Lucky Octavian (cool name! ), another finalist from Indonesian Idol Season 1 as well. The Evilbean is honoured to have a fun shot together with Lucky! Next up was Lucky Octavian! Our very own Steven Lim then decide to issue a challenge to the Indonesian Idols, and I have captured this awesome moment on video, YOU ABSOLUTELY MUST CLICK THE PLAY BUTTON! After the PK, we had Rinni Wulandari, who is the Indonesian Idol Season 4 winner, to belt out a song from her upcoming single - Independent Girl. Despite the technical fault halfway through her song, she was unfazed and decided to perform a "Someone Like You by Adele", which was equally awesome! #5evilbeans for the way she handled the situation! 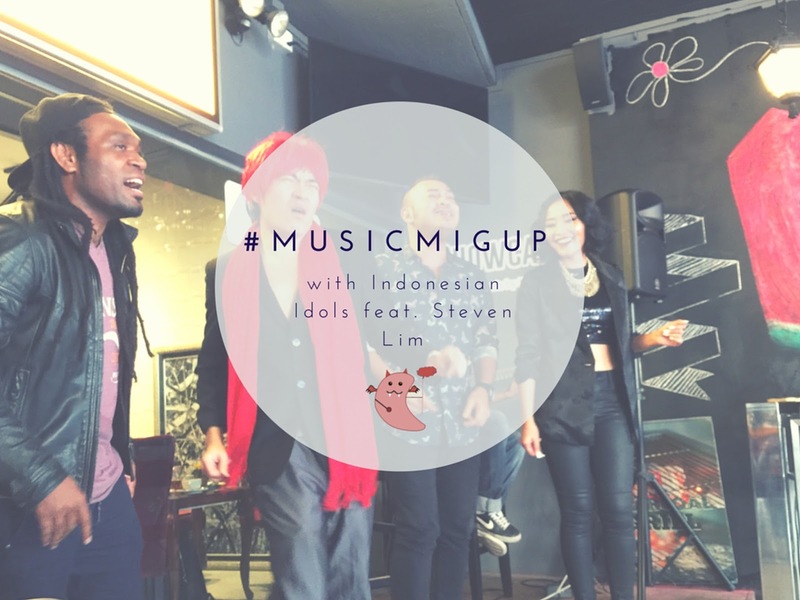 The #MusicMigup ended with a group performance of an Indonesian song together, with Steven Lim as the dancer. Thank you Migme for the invite to the #MusicMigup! If you do not know what Migme is, check out my short comic introduction about Migme here, and if you already have an account, follow me on Migme @evilbeany for more interesting Migme events and updates!